Every woman are curious to know about the expensive accessories which would spice up their look. Wearing expensive and attractive pieces of jewellery plays a vital role to add more elegance and enhance your beauty as a woman. The obsession for jewellery is an unending craze for every women. Lot of rich people are interested in collecting these magnificent pieces irrespective of their cost. In that stream of expensive jewellery lets have a look at the world's most expensive necklaces. 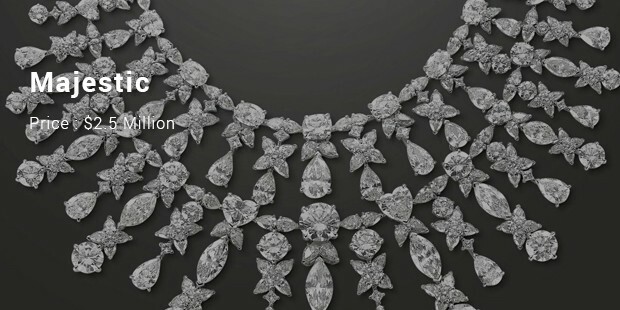 The necklace that weighs 637 carats is inlaid with 102 satellite diamonds in addition to a 407.48­carat flawless diamond. All the diamonds are set in an 18­ Karat rose gold necklace. The Necklace was created by Mouawad that is head quartered in Geneva, Switzerland. 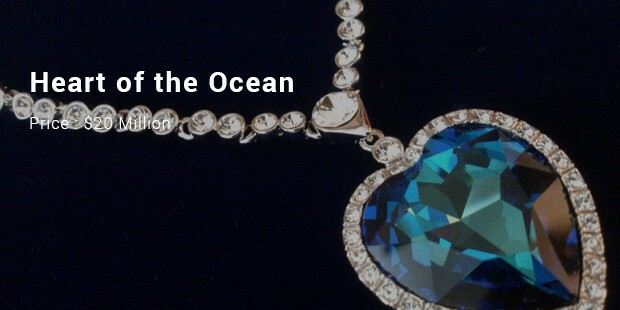 The Incomparable costs about $55 million to be the most valuable and expensive necklace in the world. This diamond is one of the most famous diamonds in the whole world not because it is very expensive, but because it appeared in Titanic which is also one of the most famous romantic movies. This stunning blue sapphire diamond necklace was worn by Gloria Stuart at the 1998 Academy Awards. The original Winston necklace has a stunning 15 carat blue diamond which is the reason for such an expensive price tag while the replica worn in the movie costs only $10,000. 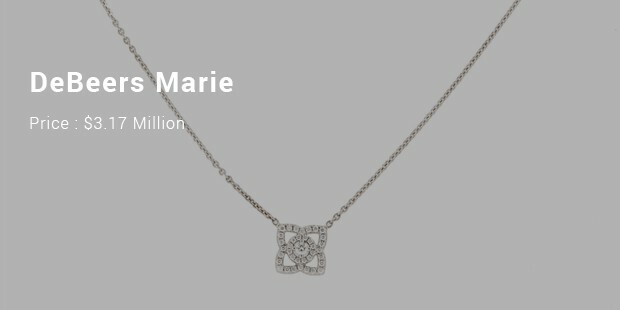 The necklace was created by Gerrard that is known as one of the oldest and most famous jewellery companies in the world. 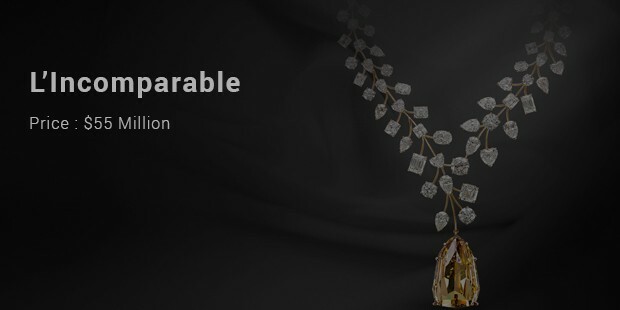 The most amazing thing about this necklace is that the diamond necklace weighs about 155 carats since it is inlaid with other 150 diamonds, so it deserves to be sold for $14 million. This necklace is the queen of all heart­shaped diamond necklaces. The flawless Briolette diamond weights more than 75 carats . 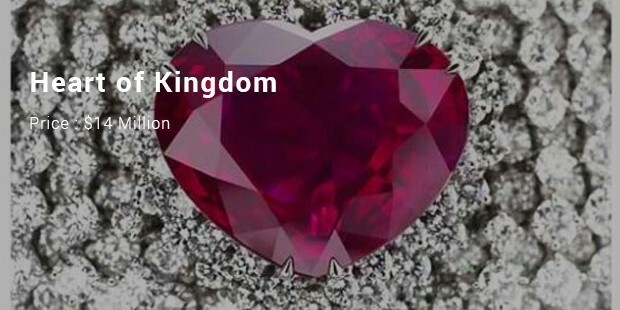 It has a purple-pink diamond marquise attached with it. 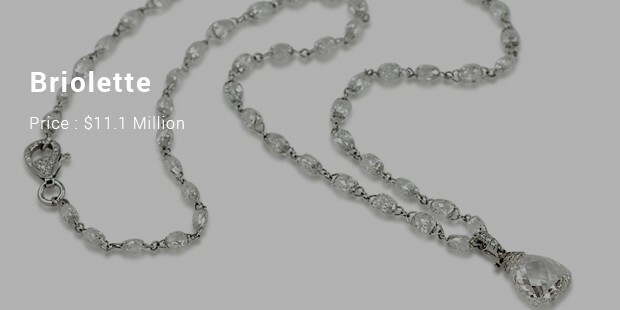 The smaller briolette diamonds are set on 18 carat white gold chain with an adjustable length. The Briolette Diamond Necklace which is 75.36 carats was sold at the auction held at Christie’s in Hong Kong that too for a whopping $11.1 Million. Oscar Nights , an event for the Celebrities to flaunt their expensive jewelleries . It is known to lend eye-catching jewelleries of the top celebrities . 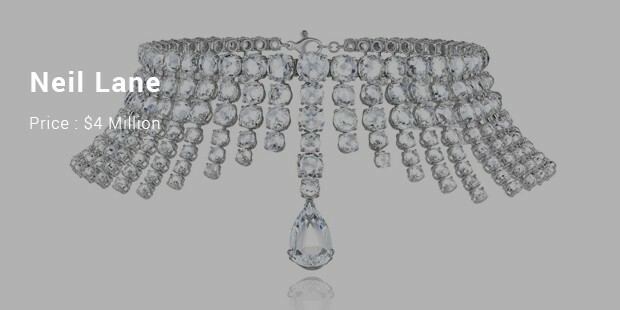 Neil Lane of The Los Angeles created one of his top and best creations and one of the most expensive diamond necklaces. Neil Lane , the jeweler , was the first one and continued till date to be the most favourite jeweller to the stars. DeBeers Necklace was set in platinum and it has 181 carats of the most precious diamonds which are set beautifully in platinum making it to be , as one of the most expensive diamond necklaces. Added to the 181 carats, is a big huge 8 carat white diamond that actually steals the show. This Necklace of sparkling diamonds also include the lovely 1.84 carats of pink diamonds, and two yellow diamonds of 5.24 and 7.06 carats each. Tiffany & Co. which made a beautiful pear shaped necklace with a 41.4 carat diamond . 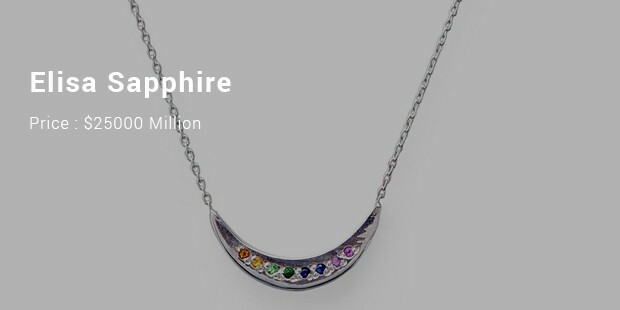 The solitaire which was set in Platinum added to the list of most expensive diamond necklaces in the world. A true show stopper the Tiffany Majestic Necklace was designed to showcase the exceptional Regal , a rare 41-carat pear shaped diamond. Bulgari joined the list of the most expensive necklace brands of the world with its beautiful and marvellous Elisa Sapphire necklace design which weighed more than 24 carats, with the oval shaped necklace, it also has oval shaped links which end with a sapphire at each point, making it an extremely unique piece. When two precious things combines together it becomes a masterpiece, similarly combination of both diamonds and necklace makes the piece more expensive. An expensive diamond necklace is just more than a simple accessory. It’s a statement of opulence and class that will set members of your family apart for generations.